This light, nourishing broth, bursting with anti-oxidants and vitamins is the Malaysian-Chinese mother’s miracle cure for that cold you just can’t shake off. A single bowl of this detoxifying elixir, packed full of watercress, goji berries and carrots will fulfil of your entire week’s superfood quota in one hit. A staple dish at our family dinner table, my godmother would always bring a large bowl of this out, followed by a firm instruction to ‘lai, lim th’ng!’ (literally meaning ‘come drink soup’ in our local Hokkien dialect). It’s one of the simplest things to make and the flavours, although delicate, are incredibly delicious and rejuvenating. 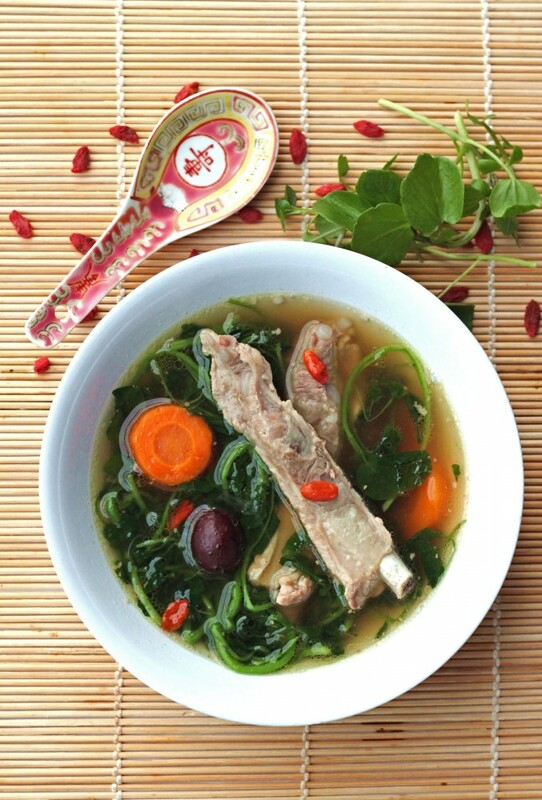 Cook this soup long and slow until the pork ribs become melt-in-the-mouth tender and fall off the bone. You can also substitute the pork ribs for chicken portions if you prefer. Blanch the pork ribs in boiling water for 3 – 4 minutes and drain any scum and excess fat away. This makes for clearer and purer broth later. Combine the pork ribs, peppercorns, garlic, carrot and red dates into a large stockpot. Cover with about 1.8 to 2 litres of water and bring to a simmer. Cook for about 1 ½ hours until the ribs are tender. Add the goji berries and watercress to the pot. Cook for 3 – 4 minutes until the watercress is wilted and its flavour has infused into the broth (careful not to overcook the watercress, it should still have a bit of vibrancy in its green colour). Season the broth with soya sauce and sea salt to taste and serve with simply steamed jasmine rice. It’s the mother of all Malaysian-Chinese broths! You can tell this will do you good just from the colours. I almost want to get sick just for the excuse to try it. Thank you for sharing the recipe. I’ll try my best not to! What you up to now? yes, my family loves to lim th’ng! , by adding crushed peppercorns and garlic, would be more flavourful than I used to make. Thanks for the recipes ! @Paulene: You are most welcome! Thanks for stopping by the blog. Delish! Thanks for the share!